Joining me today are family proprietor Lia Tolaini and winemaker Diego Bonato of Tolaini. Lia, Diego, thank you so much for sitting down with me today. Giovanni, our pleasure, thank you for doing this. Congratulations on your blog! It is very interesting and we follow it. 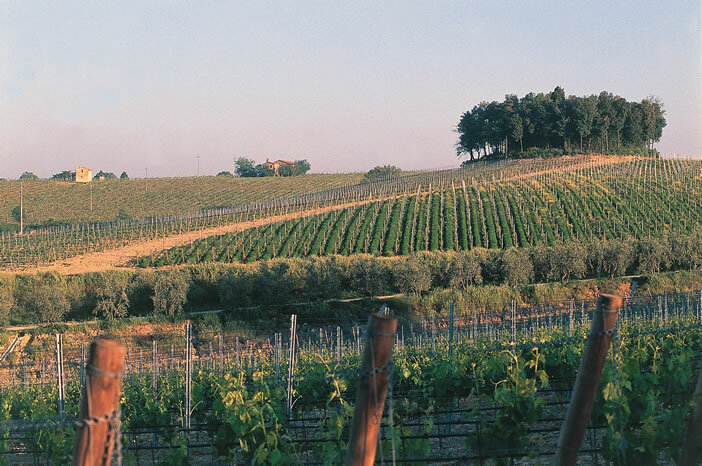 By Tuscan standards, Tolaini is a new endeavour, having only produced wines since 1998. However, founder PierLuigi’s – “Louie’s”, passion for quality has already put this estate on the map. Before diving into the interview, I want to share a story about the genesis of Tolaini, decades before it became what it is today. Lia, you know, it’s funny, many of the wineries I love are run by women. Stella di Campalto, Planeta, Scavino, and some that I’ve interviewed here including Piaggia, Castello Banfi, Snowden Vineyards and now Tolani. Yet traditionally, it seems like men are more prevalent in the industry. That perception seems inaccurate from my experience. What do you think? It is a man’s world historically as no women actually go and buy vineyards. Farming has always been a “mans” job and viticulture is farming. The women’s Association for Wine in Italy has grown from 0-500 members in less than a decade because 99% of women inherit family wineries in Italy from their husbands or fathers. Like most businesses they are handed down. Not unlike myself. My father started the winery. I find myself more and more involved because I love it, but I often wonder if I would ever have thought of buying or starting my own farm. Probably not. I think men love having women in wine so it’s not so much of a club at the winery level, but might be so at the sales, importing and distributing level. There are less women in that side of the business than I would expect to see as it’s an easier choice for a career. The inheritance factor cannot be understated and makes perfect sense. I see it happening from Sicily to Piedmont. As the old guard retires or passes, many times it’s the daughters taking over the reigns. 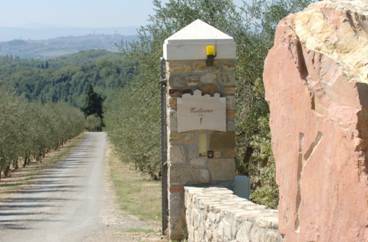 The Tolaini Estate was bought by your Dad, proprietor PierLuigi in 1998, is that correct? What was the estate being used for prior to purchase? Yes, it was a winery with older vines planted haphazardly among olive trees. Old style, un-manicured, and somewhat neglected. There were lot of forested areas as well. Among the first significant undertakings on the property were the rebalancing of the soils (1998-1999) and the replanting of the vineyards in 2000. What sort of “re-balancing” was required? We took the top soil off, dug down 3 meters and removed the enormous rocks (like the 3M tall one at the gate with our Y logo now engraved on it). This was to break up the soil and make it easier for the roots to grow deep faster. We then put the top soil back. We planted the vines in high density as our philosophy is to make a rich wine with good structure so high density is very important to fruit quality. Of the 267 acres on the estate, just 160 are under vine. What comprises the balance of the estate besides forest? What else do you produce from the estate? Yes, we have olive groves from which we make top quality extra virgin olive oil and sell most of it to the Four Seasons restaurant in NY under their private label. The rest of the estate is forest. We also use wood from our forest to heat the winery in the winter. Pierluigi is a driven perfectionist, yes? What is his role in the winery? PierLuigi has been a perfectionist in everything he’s done. He believes if you do something, do it right and to the best of your ability. He has been successful at many businesses because he has a vision and does not see obstacles, only opportunities. Luigi’s role is owner and visionary. He knows where we are going and he can quickly help differentiate between a reason and an excuse. He is the driving force behind the winery. Ok, then let’s discuss the winemaking philosophy. You employ the renowned consulting winemaker Michel Rolland. His resume precedes him. Your winemaker is Diego Bonato. How do they work together? Who is more hands on in the crafting of the wines? This is a great question. At first Michel was instrumental in us understanding all of the details required for making a great wine. He helped train our people in all aspects, and most especially vineyard techniques. He is a top consultant because he knows the entire process. I believe there are few such people who have his amazing palate and have done so many harvests so successfully. He has a respect for the terroir that even many local famous enologists do not. He chose to work with us because of the terroir and the winery my father built, starting with the vineyards. Even if you are Warren Buffet, with unlimited funding, without great terroir you cannot make great wines. Diego Bonato and his team, Francesco Rossi, Asst. 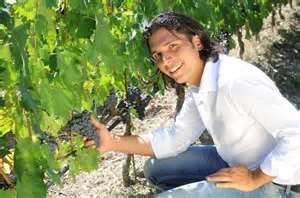 winemaker and Davide Xodo, agronomist are young Italians who share the vision of my family. They have graduated from agronomy/enology and have traveled to other parts of the world to work harvests. They understand the process and have the same desire to make the best wine possible. Michel’s right hand man Steven Blais comes to our winery every month for a few days. Having many eyes on the situation helps everyone. Nothing is missed. Michel now comes almost exclusively to do the blend but still plans visits during harvest to see what is being done. Undoubtedly it is Francesco, Diego and Davide who make the wines. They are fortunate to have a lot of seniors to ask questions of, who can offer amazing insight, but they are the hands on team. One of the facets of the new winery you built were the barrel aging cellars. I was interested to read on your website the discussion about the degrees of toast for your barrels. Which wines are aged in the “heavily toasted” barrels and why do you think that’s important for the wine? We never use heavy toasting, at the most medium. We are very conscientious about the use of wood. We put only the more structured wines into medium toasted new oak, which adds a finesse and roundness to them after ageing. So by “more structured” you’re referring to Valdisanti and Picconero, yes? I found this statement on your website intriguing: “We employ gentle, yet not entirely traditional winemaking techniques..” What sort of techniques are you referring to? Another good question Giovanni. This is mostly in reference to gravity. We don’t use pumps. We have three tier stainless steel tanks which easily facilitate delestage and pigeage. These are 2 historical techniques in quality winemaking but we use a special designed tank and gravity to complete these otherwise brutal manual tasks. Having said that, we have 12 oak fermentation barrels where we do manual pigeage…again an example of traditional winemaking. Sometimes it is the only way. Less pumping, French oak, these are the gentle techniques that are not so traditional. We also have a hydric-stress meter for judging the amount of water in the vines. This is a modern yet gentle technique to evaluate better when the plant is in danger and needs water. We have irrigation, another “modern” technique, but we only use it when the plant absolutely needs it. These are all gentle non-invasive techniques that help the winemaker/agronomist. Delestage and Pigeage are the classical French terms for racking and stomping of the grapes – the latter typically called “punching down the cap” in modern terminology. The innovation is impressive indeed. One thing I found amazing, was the story of Luigi inventing the “Rossetto” – a specially designed tractor used by vineyard laborers to more comfortably harvest grapes. 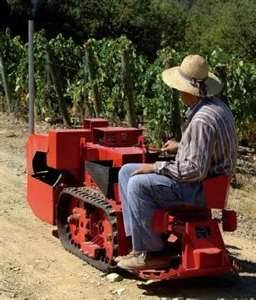 Luigi conceived, designed, constructed and patented a red track-driven mini-tractor that estate workers steer with their legs while sitting across it side-saddle, facing the vine rows. They don’t have to walk, carry loads or, worse, keep bending over all the time. They sit with hands free to prune, harvest, or thin. Yes, it is quite the toy! During the 2007 harvest, we had a 50% savings in time and 40% in labor, even though we still did everything by hand. We harvested more and better grapes, and the workers were very happy. As you’ve noted, terroir is important. What is the defining characteristic of Tolaini’s terroir? When I tasted the 2007 Al Passo, I made note of decaying undertones, barnyard, or “garrique” as the French would call it.. It lended complexity to the wine. Is that typical? It reminded me a little of Chateauneuf du Pape. Is that Rollands influence? It is the use of Botte grande, or large oak casks, that give a more animal note to the Sangiovese. This definitely is not Rolland’s influence. We don’t use barrique for our Sangiovese. I agree 2007 was more “French” on the nose and I attribute it to the use of larger second use oak barrels. Great wines are only made in the vineyard! The quality of the fruit that comes into the winery determines the quality of the end product. This is something everyone knows. The enologist’s job is to use for example, oak and blending to maximize the character of the fruit that comes from the vineyard. If you have bad grapes, the wine will be bad. Unfortunately there are probably many wineries that have good grapes but without a capable enologist they can’t bring out the best in those grapes and end up with a mediocre wine. I have never heard of a winery with bad terroir making a great wine. (unless they buy fruit). Wines are limited by nature, the vintage and the terroir. Michel makes great wine because he consults for wineries with great terroirs (the best) and he has experience with so many facets; especially various vintages and terroirs, that he IS a human encyclopedia! I believe the man is a genius because he has the world’s best palate, and he has common sense which makes him one of the most intelligent people I know PLUS he has the experience. High praise indeed, but I’m certainly not surprised. You say that your Sangiovese doesn’t see barrique and is aged in used botte. Wine lovers debate constantly about the merits of new oak versus used oak, large botte, or small barrique. I notice Tolaini employs French oak exclusively. What is your stylistic trademark regarding oak influence in your wines? Here we do what our winemakers decide. New oak is important but again, too much is never a good thing. It is about quality wood and balance and not being invasive…”gentle but not traditional”. Arguably, Tolaini’s two flagship wines are made from international varieties. “Valdisanti”, which is Cabernet Sauvignon with Sangiovese and “Picconero”, which is Merlot and Cabernet. The former recently received the coveted “Tre Bicchieri” award from Gambero Rosso, the publications highest acclaim. That’s a great achievement in less than 10 years time. Is that the estates first “Tre Bicchieri” award? How did you celebrate that achievement? Valdisanti 2008 received Tre-Bicchieri last year and Picconero 2009 received it this year. We are very excited and proud to receive these awards. To get this esteemed award so early is a testament to the work of the team at Tolaini. No one sleeps. It is also a testament to Gambero Rosso as they have taken the time to taste and recognize a new, non-historic winery. But we are not entirely happy with our wines and are constantly asking how can we make them better. An extra green harvest? Removing the leaves in early September a few weeks before harvest? The wines are improving every year. As the vines age and as we have more experience we are excited about the future. It is important to note that we planted the vines according to the terroir, not according to the wines we wanted to make. We have a lot of cabernet because in the lower altitude, and softer hills where it is a bit sandier we planted cabernet because it would thrive. The wines are a product of planting to the terroir. That is an interesting point. I know that it happens elsewhere, but it seems somehow refreshing with the way you emphasize it. You also produce the Super Tuscan, “Al Passo” a Sangiovese and Merlot blend. I have often asserted that those two grapes are an excellent marriage. Since Tolaini is located within the Chianti Classico zone, and the blend meets the requirements of law, why not label Al Passo as a Chianti Classico Riserva? We could absolutely label Al Passo as a Chianti Classico Riserva. In the first few years the Sangiovese vineyards were the ones that made us worry the most. Sangiovese is a more difficult grape to grow and unless you have a lot of passion, it is hard to do it very well. I have always respected anyone who can make a great 100% Sangiovese wine because it is a challenge. For me a Chianti Classico Riserva should be 100% Sangiovese, like the other 2 great wines of Italy which are 100% mono-varietals: Brunello and Barolo. Ha! Are you slighting Barbaresco? Merlot is at home in Tuscany and as much as the Sangiovese makes us work it is a pleasure to see the quality every year in the merlot. I agree that it is a natural marriage and for this reason I feel Al Passo will be the wine to watch from the lineup. As the Sangiovese and Merlot mature, the wine is destined for greatness. In a recent blind tasting in New York City, Al Passo won its flight by beating out Tignanello, Le Volte and Montevertine Rosso. All 9 tasters picked Al Passo as their number 1 choice. That is a serious accomplishment indeed and although the wines you mention are differing blends of Sangiovese, they are all fine pedigree. If anything, it proves that Al Passo belongs. What are the challenges facing Tolaini right now? What is in store for followers of the winery? The challenges are mother nature and time and selling the wines. We are working constantly on doing everything we can to bring the wines to the next level. The age of the vines is important and tasting the 2010’s in the winery is exciting because you can taste the increase in quality. We make not more than 200,000 bottles of wine, the biggest challenge is increasing quality which means more labor costs, and in some vintages it means less quantity, so selling the wine for what it is worth is the biggest challenge. Wine is also a business and it costs a lot to make great wines every year. Mechanizing and increasing quantity are not an option for us. Prices are low in the US right now and there will be more and more wines of quality on the market as everyone now knows how to make great wines. The secret is out. People will see with 2008, then 2009 and with each vintage the quality will increase. Well, Tolaini definitely seems to be off to an excellent start. I can’t wait to see how the vintages improve, especially the 2009’s. Finally, I have a tradition of asking this last question of all my interviewees. After you are done walking the vineyards, tending the blends, cleaning the cellars, and attending to anything and everything else that must be done, what does Diego uncork when he goes home for the night? In the summer it is beer! After tasting grapes and working in the heat, there is nothing like a great beer! In the last few months I don’t think I’ve eaten or drank anything…. I’ve been that busy. We often do blind tastings of Tolaini against the top wines from around the world and we often have our “competitors” over for dinner to taste our wines together blind. It is always interesting and you learn a lot about your wines in an arena like this. It’s important not to wear blinders when tasting and to taste blind often. I agree, tasting blind can be a humbling experience. I’ve done blind tastings for Tuscan Vines so I know first hand things don’t always happen as one would think. Allora Lia, thank you again for joining me today. I look forward to trying many more of Tolaini’s wines. Cheers! John, this is a remarkable and profound interview; your questions and their answers were precise, provocative, and informative. Those who love wine, owe you-all a debt of gratitude. This is just one of many reasons why your blog is worth reading everyday! Thanks so much, that means a lot to me. It really does and it's quite humbling. These interviews are fun, but I learn a lot doing them. The one thing that resonates with me, is that to a man and woman, each and every person I've interviewed have been so proud of their work. So dedicated and so passionate. It actually makes me appreciate their wine even more when I enjoy it. I intend to continue these – and have at least 2 or 3 more in the que. Thanks again so much for you comments.